The BugE is a kit so builders have installed a variety of motors in them. The BugE motor that is closest to "stock" would be the Advanced DC motor 140-01-4008 that was sold by EV Parts in their BugE electric package. The motor has two very nice features. First, it needs no modification to bolt into the mounting plate on the BugE swing-arm. Second, it can be run in reverse. That feature makes the BugE easy to park, unlike a typical motorcycle that usually has no powered means of reversing out of a parking space. However, there may come a day when there is a problem in the traction circuit may require some troubleshooting. Fortunately, the motor is an item that is relatively easy to test. The Advanced motor, unlike a typical toy motor, has no permanent magnets. Instead, electromagnets are used. To see how the motor works, a test table can be made by strapping down the motor to a table. A car battery can provide enough current but keep the speed low enough to avoid "over spinning" the motor. 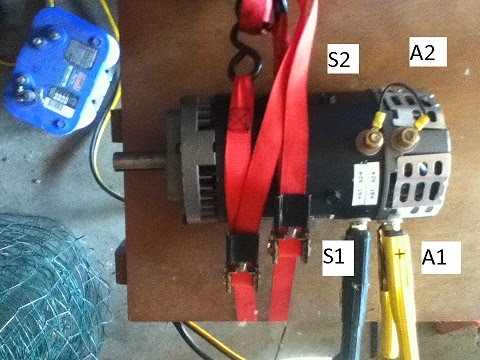 To test, make a small jumper for the field coils then apply power to the commutator terminals. When 12v is applied, it will rotate with lots of torque and relatively fast, but not fast enough to destroy itself. It really only needs one strap since the rotation force from start up without a load isn't too much but it's better to be safe than sorry! Why 4 terminals? It's a rather flexible arrangement when it comes to using the reversing switch as sold by EV parts. For those who like schematics, here's a drawing.